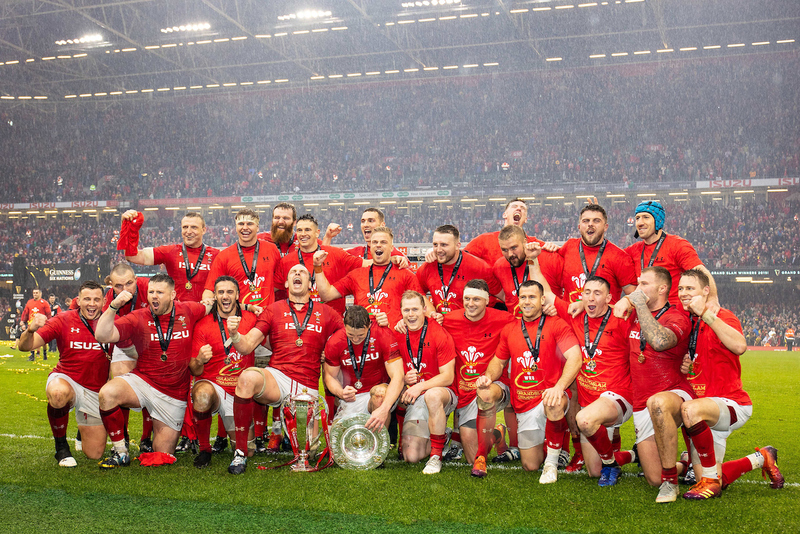 Wales: Six Nations Champions 2019. Pic: Simon King/Replay Images. With another Grand Slam delivered, Warren Gatland now has his sights firmly on the World Cup in September. The build-up should have player welfare and team preparation at its heart. Instead, Robin Davey fears it’s mainly about the money. Grand Slam fever abounds in Wales and rightly so. The team’s unforgettable achievement crowned a gripping Six Nations campaign on Saturday evening with that magnificent victory over Ireland. It lifted them to the number two ranked team in the world and gave inspirational coach Warren Gatland the third Slam of his career – one more than any other coach has achieved. All wonderful stuff. But it’s worth a cold, hard look at what Wales have signed up for in terms of their preparations before the World Cup in Japan. The players now go back to their regions, where there are Guinness Pro 14 fixtures to fulfil and – hopefully – for a few, there may even be play-offs. Then, after a short break there are four, yes four, more internationals to be played before the World Cup gets under way in Japan in September. Now, it’s fair enough and sensible for all countries to have perhaps two warm-up matches as sides count down on their preparations and squads are finalised. But do we really need four of them? Is it the best idea in the world to play England twice and Ireland twice, so recently after playing them in a tournament that actually matters? Georgia are in Wales’ pool. Why not a fixture against Russia? To prepare for Uruguay, why not a match against Brazil? Have you seen them scrummage? The English and the Irish should be special once-a-season contests. Playing them both twice really is overkill at the height of summer when fans are either away on holiday or have other things on their minds. On top of that, having as many as four ‘rehearsals’ undoubtedly increases the risk of players suffering injuries. You can be pretty sure that someone is going to get injured and miss out on the chance of a lifetime. Money is, of course, a factor for the World Cup means there are no autumn internationals so unions, Wales among them, are going to suffer a loss this year. Having two home friendly internationals will help, of course, but their appeal will be limited. Supporters obviously realise nothing is at stake and players, perhaps, will not be going flat out. The price of tickets will be lower than usual, of course, but fans’ pockets are already severely stretched what with the autumn internationals, then the Six Nations, so a couple of essentially friendly matches in August will, in many, cases simply be side-stepped. Liam Williams of Wales celebrates the win. Pic: Simon King/Replay Images. Normally, Wales matches against England and Ireland would attract a full house, but mere World Cup warm-up games in August? That’s another matter altogether. But we are where we are and Wales take on England at Twickenham on August 11 and then again at the Principality Stadium on August 17. They are followed by an Irish double header at home on August 31 with the return staged in Dublin a week later. That’s four internationals in just under a month which seems like a daft idea and while it will formulate ideas in the minds of coaches and help boost team spirit with a sense of togetherness it will mean precious little in reality. More important, as previously said, there will be a real risk of someone getting injured and missing out on the World Cup, Wales’ opener arriving on September 23 against Georgia – a potential banana skin. Having said all that, Wales will go in with their confidence sky high after their memorable Six Nations campaign rightly rewarded just 48 hours later with a reception at The Senedd. Wales have clinched four Grand Slams since the Six Nations included Italy in 2000, more than any other country, taking them to just one behind England’s grand total of 28 while Gatland became the first coach to win three of them, the previous occasions being in 2008 and 2012. In the process, Gatland and captain marvel Alun Wyn Jones will be revered in Wales for the rest of time – Gatland for his superb coaching, man-management and tactical nous and Jones for his leadership qualities which have earned him the respect of the nation. Winning the World Cup is now the major focus and Gatland believes Wales can do it. Just imagine the scenes. But in order to scale the summit Wales would probabaly have to beat the All Blacks. Ireland have done it, not once but twice. In a World Cup though? That’s another matter altogether. We can but dream . . .